Personalized banner pens / scroll pens are the best promotional pens available & we specialize in them 100%. 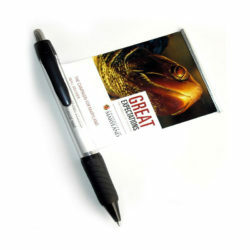 Our scroll pens comes with the same great benefits of ‘normal’ promotional pens but with much more space to educate and promote to your customers with their unique promotional pull out banner. Promotional pens are fantastic and are the most popular promotional products used by businesses. They are useful for customers, can sit on your customers’ desks in clear view for months if not years at a time, they’re portable, come in a wide variety and are super economical. A banner pen (or scroll pen) takes it a step further, including all the benefits of ‘standard’ promotional pens but with far more space to promote to, inform and educate your customers with their unique and interactive banners. The big advantage with our personalized banner pens (or scroll pens) is that you get the ability to be able to increase the value of the pen dramatically (and the length of time the customer hangs on to it for) by including some great information on the banners that the customer goes back to time and time again. And every time they use the scroll pen they are reminded of your branding and how you have provided some great information to help them out. Without a doubt the best value for money scroll pen service in the USA. Don’t wait days or even hours for a formal quote. With us you only have to order 500 scroll pens at a time. We have years of experience & are a large supplier of banner pens throughout the USA, UK & Australia. We ensure that your scroll pen order makes it to you on time – not just out our door. Online marketing at the moment is all about ‘content marketing’ and using articles and videos online to be able to strengthen a business’s profile and positioning as industry experts. The only problem with this is that customers are being overwhelmed with the amount of online articles, newsletters and promotional videos that are being sent their way via emails and social media. To help resolve the issue of ‘online overwhelm’ customers have been using personalized banner pens as an offline ‘content marketing’ tool to be able to get their message to cut through and have it hang around for far longer than the quick glances that most online marketing achieves. A banner pen (or scroll pen) is perfect for being able to share helpful resources, timetables, maps and other useful tools with your customers to help build your profile and importantly stay in front of them and on their desk for months and months. Unlike most promotional pens, our scroll pens provide added value via the content you place upon the banner, giving you a great opportunity to position yourself away from your competition and leverage your ‘content marketing’ strategy offline.